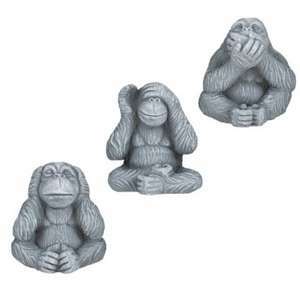 Back In Stock, so go bananas for these wise ape ornaments, perfect for every garden at a great price of £1 each. Without the fourth monkey, its just visually rhetoric. The fourth Monkey is DO NO EVIL, so without it the other 3 are just rhetoric in a visual form ( lacking in sincerity or meaningful content) being able to do the fourth just makes the other 3 an hypocrisy. The fourth Monkey is DO NO EVIL, so without it the other 3 are just …The fourth Monkey is DO NO EVIL, so without it the other 3 are just rhetoric in a visual form ( lacking in sincerity or meaningful content) being able to do the fourth just makes the other 3 an hypocrisy. For a pound, if they last the year, I'll be happy, but I can always put them in the shed before the winter hits and prolong the life of them. Oh my, so did I!! Glad somebody else has the same mindset as me!! If you brought the first ones which were hollow, so did mine! But these maybe the solid ones they had a few months ago and they are much better quality.